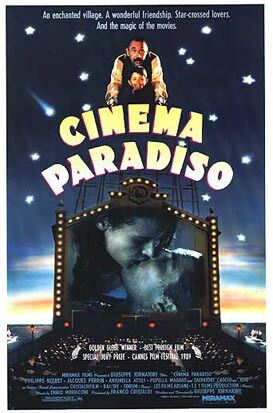 For twenty odd years, movie-goers in the small Sicilian village of Giancaldo have been deprived of witnessing even so much as a kiss up on the screen of their local Cinema Paradiso. The town’s priest has taken it upon himself to censor any hint of erotica from the latest releases and the out-takes have piled up like spaghetti in the projection booth. Here, in the cinema’s claustrophobic nerve centre, Alfredo (Philippe Noiret) the projectionist reigns supreme until a persistent, and ultimately irresistible little boy named Toto (Salvatore Cascio) inveigles himself onto the scene. Enraptured by the magic of movies, Toto learns how to work the huge projector and manage the giant spools of film. Alfredo even shows him how to simultaneously cast the image through the roaring lion’s mouth onto the screen and out onto the walls of the piazza for all those who couldn’t get a ticket. Back in the 50s, before the advent of television, cinema was one of the few forms of popular entertainment. It was also a time when was made of highly flammable cellulose nitrate and when it ignites one night in the booth, the illiterate Alfredo is tragically left blinded. So it falls upon young Toto to take command, which he does with aplomb, growing more and more confident over the years until he finally steps out into the world, picks up an 8 mm camera himself and embarks on a career as a filmmaker. With excerpts from black and white classics by Renoir, Visconti, Antonioni and more, Cinema Paradiso is a salute to the power of the projected moving image. It’s also a tribute by director Giuseppe Tornatore to his home town’s projectionist who was much like a father to him. In an abbreviated form, the film won a Best Foreign Language Oscar. Now, a full 51 minutes have been re-instated for the release of the original Director’s Cut, which for film buffs, will no doubt play like pure, unadulterated paradise.